Passion, jealousy, scandal and betrayal – a true-life Regency Romance of the rise and fall of an extraordinary woman born into extraordinary times. Growing up in a poverty-stricken, fatherless household, Dorothy Jordan overcame her humble beginnings to become the most famous comic actress of her day. It was while performing on Drury Lane that Dorothy caught the eye of the Duke of Clarence, later to become King William IV. Her twenty-year relationship with the Duke was one of great happiness and domesticity, producing ten children. But ultimately, Dorothy’s generous nature was her undoing and she was to be cruelly betrayed by the man she loved. Not a woman with whom I'm familiar. I'm sure this will make a fascinating read. I too am unfamiliar with her -- I'm definitely going to have to get this book! I haven't heard of this woman either. I'm intrigued. I love a story about a woman who managed to overcome her humble beginnings to become well known and wealthy. Many women in the past were so strong and to be able to do something like this in a definite "man's world," was a huge accomplishment. 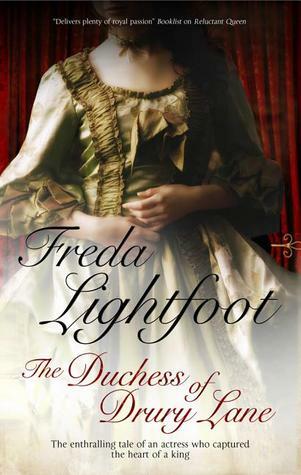 I'm certainly looking forward to reading "The Duchess of Drury Lane." Thanks, Amy!